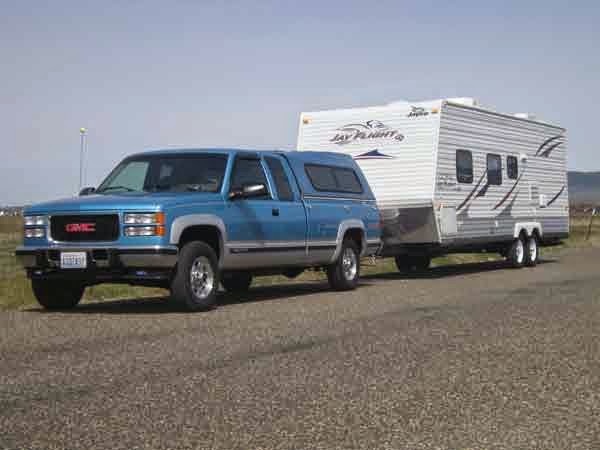 The GM 6.5 L diesel truck has a reputation of overheating when towing or hauling heavy and uphill. 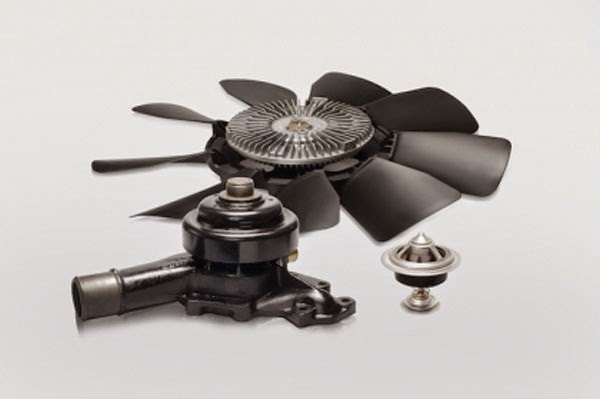 Those models built prior to 1997 were supplied with a cooling system that, even under the best of circumstances, provided only a marginal performance. Most of these vehicles were not able to maintain coolant temperature at or below the maximum – in my book – allowable 210°F. The normal accumulation of bugs, dirt and crud in the radiator and A/C core made a bad situation worse. Beginning with the ’97 models, GM increased the water pump flow, added a dual thermostat setup and a slightly improved fan clutch in an effort to make things better. These improvements affected a bit of an improvement. Through years of experience with the 6.5 L diesel, working it hard under towing conditions, Heath Diesel has determined some important and effective remedies for the cooling inadequacies that plague these trucks. Heath Diesel had long known that retrofitting the ’97 high-output water pump with the dual thermostat onto older models did not provide a meaningful improvement in temperature control and, while we found ways to improve the cooling system performance, the system as a whole did not deliver good and reliable temperature control under tougher towing conditions. Years ago, we investigated these engines for temperature variation by outfitting the block and heads with temperature probes. This study clearly demonstrated that the distribution of coolant to the two banks of cylinders and heads was not equal and that the passenger-side of the engine was being starved for coolant and overheated. A more recent investigation focused on coolant flow-conditions in the cylinder block and heads. Testing proved that coolant flow was reasonably equal – side-to-side – only at low RPM. As the engine speed was raised, the flow increasingly favored the driver’s side of the engine. 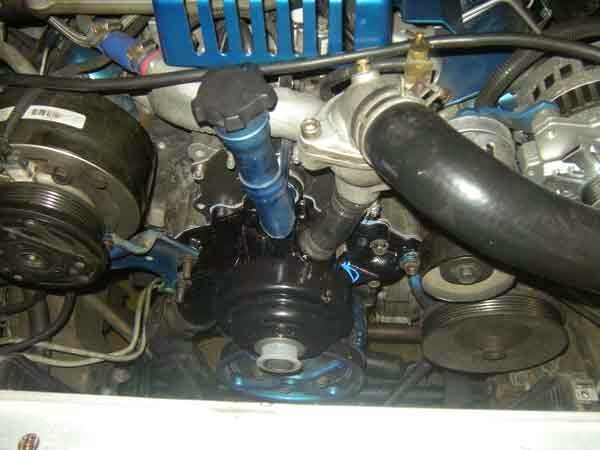 In testing a 1995 model engine with factory issue (low-volume) flange type water pump, the coolant flow was biased 76 percent on the driver’s side when the engine was at 2500 RPM. This bias in flow, combined with high engine load conditions, can have a detrimental affect on passenger-side cylinders. The factory issue, low volume coolant pump used on 1992-96 engines was found to produce approximately 75 GPM at 2,500 RPM. Again, only 24 percent of that flow moved through the passenger side of the engine. Testing a 1998 dual thermostat setup showed no improvement in bias of flow. We did find an increase in volume at 94 GPM. This means that while the older pump pushed a miserable 18 GPM through the passenger side of the engine, the later, improved style was only marginally better at 22 GPM. The numbers help one to understand why retrofitting the ’97 style pump and dual thermostat set up onto the older engine does little to affect an improvement in cooling performance. We decided to test both configurations of water pump: the older flange type as well as the later threaded stub type. We also tested both low and high volume versions of the flange type pump. In addition, we evaluated several brands of service replacement pumps from a variety of suppliers. 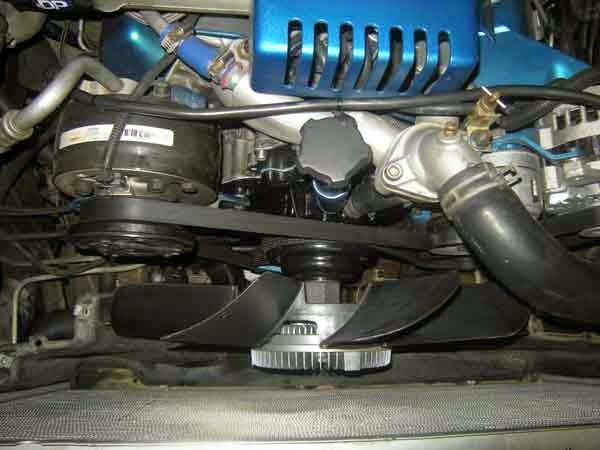 The heavy duty cooling system upgrade was installed on this 1995 GMC 6.5L. During the summer it pulls a 9,500-pound trailer through the mountains of the Northwest United States. 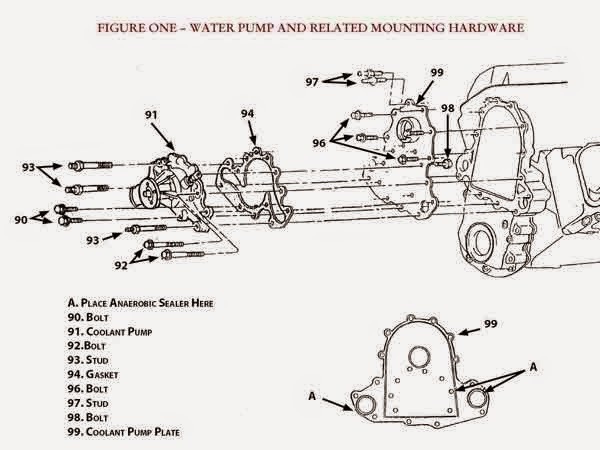 Diagram of water pump and related mounting hardware. At the conclusion of an exhaustive evaluation, we had determined a clear and decisive winner in the factory service replacement water pump: part number 88894035. This GM pump proved to be vastly superior to all others in terms of bias with a much improved and nearly equal coolant flow, side-to-side at 2,500 RPM. This represents a tremendous improvement in flow to the passenger side under heavy operating conditions. Where the flow rate on the passenger-side had been a paltry 22 GPM with the ’97 high volume flange type pump, the 88804035 pump provided 48 GPM! During this work, we performed evaluations of both single and dual thermostat systems with the good pump. We realized the best cooling system performance when we combined this improved pump with the older style, pressure-balanced, single thermostat type system. This combination creates desirable pump-pressure in the coolant passages of the cylinder block and heads that helps to prevent steam pockets. Another very important characteristic of this type thermostat is that it simultaneously blocks the water pump bypass port when fully open in order to route all coolant to the radiator under high load conditions. This is our favorite combo. In comparison, the dual thermostat setup offers no feature for blocking the water pump bypass port. Since a good portion of the heated coolant is allowed to re-circulate back through the water pump and into the engine block, coolant flow through the radiator is not encouraged. Further, the desired pressurization of the coolant passages is not attained in the dual system. The Heath upgrade kit for the dual thermostat engines includes a special, restrictor orifice necessary to the creation of water pump pressure in the coolant passages of the dual thermostat engine like the single thermostat system. Having settled on the big 88894035 pump, the next challenge was to find a fan clutch that would perform on long uphill pulls. The factory issue clutches are built with an internal working-surface area that is relatively small. The result is poor lock up and a great deal of slippage during full, attempted engagement. Driving at only 50 to 60 percent of water pump shaft speed, this high rate of slip causes the light duty clutch to give up, to ‘kick-out’ or freewheel after a period of time. We think this is the result of temperature breakdown of the viscous fluid used inside or a cavitation of that fluid – or both. In any case, most of these light duty, factory issue clutches will stop working after a few minutes under full load conditions. This will always result in a serious overheat condition unless the truck is stopped for a cool-down. Through years of towing with the 6.5, we have found that aftermarket replacement fan clutches, while representing an improvement over the factory issue unit, still cannot deliver performance good enough for longer, steeper uphill pulls. When the factory clutches proved inadequate in the heavy towing applications, we switched our focus to the clutches engineered for medium duty trucks. In this group we found a unit capable of handling the demanding conditions to which 6.5s are subjected. These heavy duty fan-clutches are designed for the long haul and the rigorous conditions to which medium duty trucks are subjected. The heavy duty clutch features greater land-groove area in combination with a superior viscous fluid. This clutch is capable of driving a big air-moving fan blade and moving great amounts of engine cooling air over extended periods of time. It just does not give up like the light duty, pickup truck units. 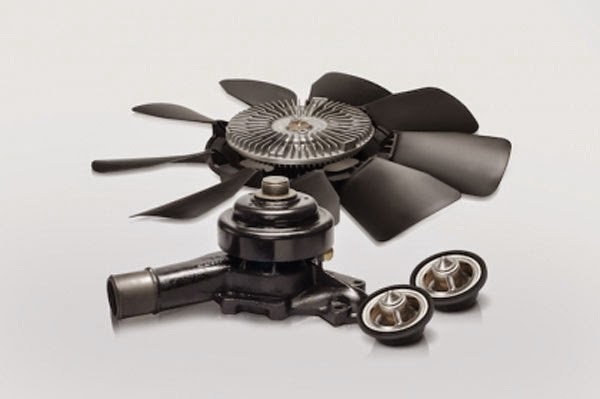 We have combined, in kit form, this heavy duty clutch with a big, efficient fan blade; both in front of the good water pump and accompanied by the correct thermostat(s) as well as all the gaskets necessary to the job. Two variations of this kit are supplied to service all trucks; a single thermostat version and a dual thermostat version. Installing the Heath Extra HD Cooling System upgrade in a single operation, accomplishes replacement of old, high mileage components while it provides a substantial improvement in cooling system performance: it’s a win-win. 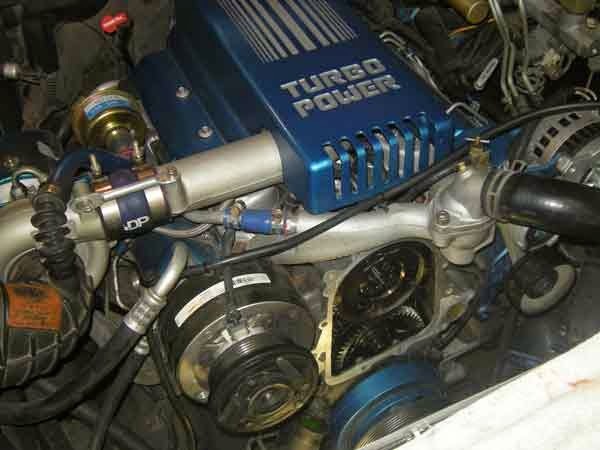 The subject of our cooling system upgrade installation is a typical ‘95 K2500 6.5 truck. This one spends its summers towing a 9,500-pound travel trailer through the mountainous regions of the Northwest United States. The owner of this beautiful Quasar Blue GMC understands the importance of maintaining engine coolant temperature at or below 210°F. Over the years, he has struggled to keep his engine temperature from climbing above this maximum threshold when towing and has spent a lot of time on the shoulder of mountain roads, pointed uphill and cooling down. Old water pump removed and ready for the new pump to be installed. New 6.5L diesel cooling system assembly installed just prior to installation of fan shroud. New 6.5L diesel pump assembly before installation of fan clutch and blade. I suggest that the tech doing this work follow published service information. In lieu of such information, we offer these step by step instructions. These are supported by an exploded view of the water pump and related mounting hardware (page 38). This drawing specifies type and location of the bolts used. These various bolts must be installed exactly as shown. The work begins by disconnecting the battery ground cables at the batteries and draining the cooling system. Next, remove the upper fan shroud to gain access to the mechanical stuff. To assure proper airflow through them, we suggest this as an excellent time to perform a thorough cleaning of both the radiator and the A/C condenser core. To do this job, remove the lower radiator shroud and radiator. Remove the truck grill and its oil cooler(s). This will allow access to the air conditioner condenser core. Gaining access to the water pump mount bolts and studs requires removal of brackets mounted onto the studs. These brackets are used to mount the various belt-driven accessories such as vacuum pump, power steering pump and alternator. Remove the water pump and its backing plate from the engine timing case. All gasket sealing areas must be made spotlessly clean prior to assembly. Clean all mount bolt threaded areas with a wire brush. Switch the water pump backing plate over to the new water pump, using the supplied gasket and Permatex Ultra Gray sealer. The six bolts used to fasten the plate to the pump are torqued to 17 pounds-feet. Install the water pump, complete with its backing plate, onto the timing case with the supplied gasket and sealer. Apply a coating of Ultra Gray to bolt and stud threads prior to threading them in, as some go into coolant passages. These water pump bolts and studs are torqued to 31 pounds-feet. Refer to the drawing on page 38 that shows the types and locations of the fasteners. Reversal of disassembly comprises the balance of the work. The owner of our subject truck has subsequently enjoyed a number of outings with his travel trailer and reports a transformation. This truck/trailer combo has since the upgrade been up some pretty tough grades in his travels throughout Washington and Oregon and he finds that the temperature gauge has yet to get any higher than one notch below the 210°F mark on the gauge. Our friend had become an accomplished judge of roadway shoulders as potential cool-down places. However, he no longer has to baby-sit the temperature gauge and, with all the free time now on his hands, he is enjoying the scenery instead. For more information about the Heath Diesel 6.5L diesel cooling system upgrade kits, visit the Heath Diesel website or call them at (877) 894-6266.